Dan is a career marketing and advertising creative director and cinematographer. He managed several major brands at Clairol, before starting a branding career that included agencies such as: Bozell & Jacobs, Foote Cone & Belding, Phillips-Ramsey/McCann Erickson and finally, Drackett & Lavidge. His recent board service includes: Sun Valley Summer Symphony, Sun Valley Center for the Arts, St. Luke’s Wood River Foundation, Hospice & Palliative Care of the Wood River Valley, The Nature Conservancy and the Animal Shelter. 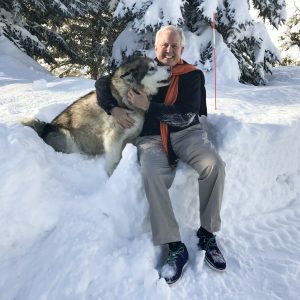 Dan and his wife, Martine, and children settled full-time in Greenhorn Gulch in 2000, where they live with their Alaskan Malamutes, Romeo and Juliette. Dan believes it is impossible to become a bad person if you have ever enjoyed the love of a great dog and that caring for a pet instills important values like trustworthiness, compassion and responsibility.